A brief bit of history on Mega Man & Bass. A few years after Mega Man 8 notoriously became a Playstation and Sega Saturn game, Keiji Inafune - the series' creator - felt that he still owed one more game to children that had not yet upgraded to next gen hardware and still owned only the Super Famicom. Technically a spin-off featuring Mega Man's rival - Bass - as an additional playable character, Mega Man & Bass was only released in Japan, later receiving a remake on the GBA that was also its début in the west. The GBA remake is the version that's now available on the Wii U Virtual Console, and while it does have some problems with level design and unfair difficulty, it's ultimately a worthy entry in the series and is recommended for longtime fans. 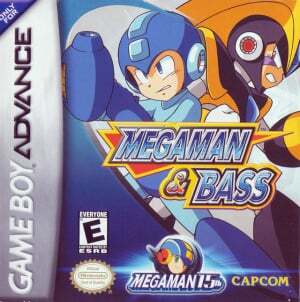 As the title suggests, players are faced at the beginning of the game with the choice of playing as either Mega Man or Bass. While each have their own unique abilities and movesets, this is a clever way of masking an easy mode and hard mode. While playing as Mega Man you're given a charge shot and a slide move, but as Bass you're given a rapid fire, seven direction buster, a dash move and a double jump. Given that the levels are designed with relatively unforgiving enemy and hazard placement, it doesn't take long to realize how much handier it is to be playing as Bass. Whichever character you choose to play as, the story still unfolds in roughly the same manner. An evil robot named King wants to take over the world, and while Mega Man wants to save the day Bass wants to prove that he's the strongest robot. In a break from the classic series' convention, only three of the robot masters are available to be fought at the beginning; upon defeating one, two or three more are unlocked in a somewhat linear fashion. This helps to distinguish which bosses are weak to which weapons and also ensures that the harder levels are generally played after the easy ones. 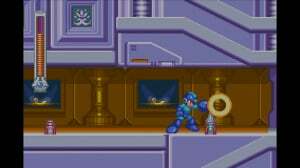 Level designs are typical of the Mega Man series, but unnecessarily large sprites make many situations needlessly more difficult and frustrating. The old-school "Nintendo hard" difficulty is still present, with plenty of spike traps, death pits, and cheap enemy placement there to frustrate you, but the controls are as tight as ever and it never loses the "one more try" feeling. Unfortunately, the sprites are a bit too large, making many deaths feel like its the game's fault rather than the player's. Occasionally, blind leaps of faith must be made or an enemy pops suddenly onto the screen and unavoidably shoots you off of a platform. Instances such as these can be alleviated somewhat by usage of Virtual Console save states, but it's a frustrating problem that shouldn't have to be dealt with. Robot Masters are also a bit of a let-down, often resorting to spamming cheap or unavoidable attacks. 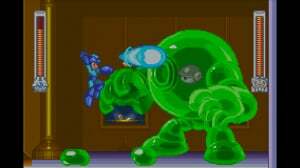 In previous Mega Man games nearly every Robot Master had complex yet predictable attack patterns. It may have taken a few tries to learn the tells, but the feeling of satisfaction from conquering a Robot Master was unparalleled. Here, it feels more like the result of luck than of skill. The problem of the larger sprites often contributes to this and makes the arenas in which these bosses are fought feel cramped, rendering many of the attacks unavoidable as there's simply nowhere to go. Fortunately, the graphics and presentation make up for these oversights in the design; every stage is vibrant and colourful, with plenty of detailed sprites and environments. Level themes are diverse and creative, with a particular highlight being a trip through a toy factory, and there's lots of charm in the enemy design. The soundtrack is only slightly above average; it has a few catchy beats, but nothing that will have you whistling the tune long after the game is over. There's a surprising amount of replayability as well, far more than the usual Mega Man game. Scattered throughout are 100 CDs that can only be collected by using specific weapons or character traits, essentially requiring at least two playthroughs to ensure that everything gets collected. Each of these CDs unlocks a short character bio on different Robot Masters and characters from the series' history, a neat little diversion that'll keep completionists busy after beating the final boss. Mega Man & Bass certainly lives up to the reputation of the Mega Man series and does enough new things to shake up the well-worn formula. While there are occasions where unfair gameplay can bog down the experience, the surprising amount of replayability and overall solid game mechanics make this one worth a recommendation. Based on the title, I thought this was a spinoff Megaman fishing title. I played the unlocalized Japanese version for SNES, and it was okay. It worries me to see just how big the characters are here, a fact that has never made any Mega Man game better. After Megaman Zero 4 this week and my hope this comes to Europe soon, I'll complete my Megaman collection on the Wii U. I'm not getting any of the Battle Network spinoff though. I love this one but I'll wait for a sale. @Gorlokk This is definitely the most difficult main series entry, but I'd still say the Mega Man Zero games are harder. Looking forward to playing and downloading this game. Haven't beaten 8 yet but I'll jump on downloading Mega Man & Bass (I own it on the GBA too). All the comments and the review say it's very difficult; I just cant' remember the last time I played it. So this is game is really hard, ey? Sounds like something for me, NOT. Even if I'm really bad when it comes to Megamans difficulty, I'll still check this game out. Eh, the game IS hard, but I think the reviewer was experiencing more difficulty because the GBA has a smaller screen. The sprites of the robot masters don't feel that big on the original SFC version, so I blame the handheld limitations. I beat the original SFC version with little difficulty because it has a MUCH bigger playing field. It really does make a difference. The only time I struggled was during King's Castle. Bigger screen doesn't help make those fights any easier... The music also takes a pretty heavy hit in the port too. Playing as Mega Man is especially hard because the game was designed with Bass in mind. @Ichiban I'd buy into that. @OnionOverlord If they just would've pulled the camera out further, this game would be improved immensely. And yeah, this was definitely made for Bass, I kinda wish this spinoff was just about him. The usually-humorous bit it bold before the article (the 'lead in', I think it's called) would have been funnier if it'd read: 'no treble' in an allusion to a popular tune. I can't take a review seriously if it cites a game as "unfair." Mega Man and Bass was a good GBA game, but a GREAT Super Famicom game. The GBA port's problem is that the camera is a tad far in (though the hitbox size isn't much different from Mega Man 7) and the fact that, though the game feels as if it's best designed around Bass's abilities, Bass can be hard to play due to the wonky dash mechanic. In the SFC original, dashing was just one button, but on the GBA version it was a double tap of the directional arrow (unless they somehow changed that for the emulation). It's a tough thing to master, but it can be done. I beat this game multiple times with each character back in the day. A Mega Man review not by @Philip_J_Reed. Just doesn't seem right. The reviewer complains about "large sprites" no less than three times in as many paragraphs. He really should study Mega Man design history. It is well known that both Mega Man 7 and Mega Man 8 follow the same level design choices, following on the footsteps of the Game Boy MM games rather than the NES entries. 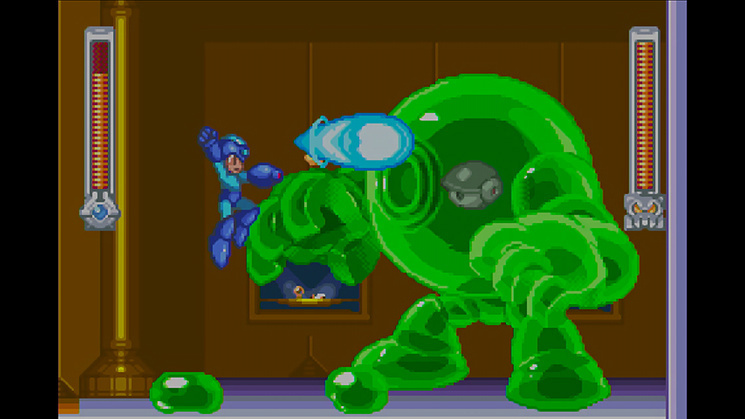 Mega Man and Bass simply followed through with the same ideas, while pushing bigger challenges. The GB games were also cramped, and taught the player to master the levels differently compared to the abundant space you had to maneuver in the NES titles. In short, you have to be more defensive and ready for the unexpected as you move Mega Man around. @dudujencarelli The problem with the sprites in this game is that they get in the way of progression. Showing less of the screen to the player to make it "more challenging", is not a design choice, but a flaw. One must ask what the core gameplay is trying to accomplish when judging these things. 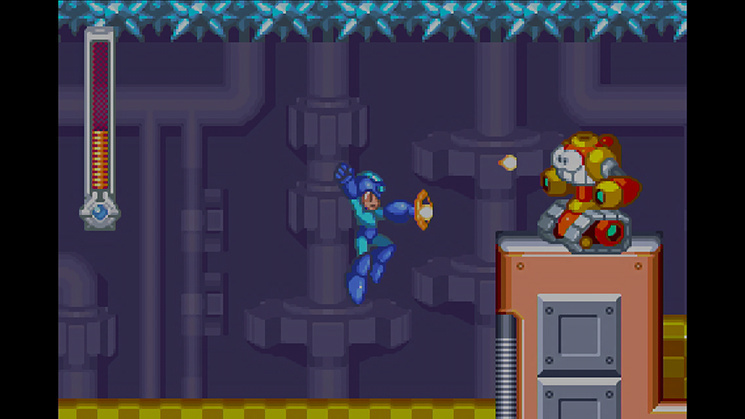 In Mega Man games, it's to test the player's skill at navigating challenging courses. The source of the challenge should come from how the stages themselves are constructed, what they contain that the player must overcome. The situation with this game is that the player is not given a proper opportunity to test his/herself against all the obstacles, the zoomed in view robs him/her of a chance to pass it in the first go. Sure, after dying once or twice you know how to pass the obstacle because you're aware of it, but these additional attempts wouldn't have to be made if the player could see the obstacles before they're interacting with them. The point is, there's a sweet spot for how much the camera for a platformer should show at any given time. Too much, and it's difficult to ensure precision in actions, but too little, and the player isn't given proper time to react to obstacles. This game falls closer to the latter. @MitchVogel But I wasn't talking about the screen size. That's obviously an issue with porting the SNES game to the GBA. I had the same problem with the Super Mario Advance games. It takes some getting used to the smaller screen. What I meant was the issue of large sprites being a nuisance for maneuverability. Mega Man 7 was designed like that, but you never had a problem seeing all of the screen. The sprites were still large, and you played accordingly, navigating tight corridors packed with mostly unavoidable enemies and traps (Turbo Man's level on that game is a good example of what I mean). MM and Bass original SFC version had the same large sprites, the only difference being you could see more of the screen. I only have the GBA cartridge and this download but it is one of my absolute favorite MM games. The challenge at first was so addicting to me. Once you really master this game in that old school way, it's such a joy to replay again and again. To add to my previous point, if you reduced the sprites on a handheld game, you'd get something like the original Super Mario Land. Borderline unplayable due to the tiny size of Mario's sprite. @dudujencarelli When you really think about it, sprite size and screen size are directly related. If one shrinks, the other must shrink as well to maintain harmony. I've never played the original, but if you really were able to see more of the screen, then that just means they didn't shrink the game accordingly when they ported it to a smaller screened device. This was one of the MM games I missed, so it's nice to have it on the VC regardless of system. Wish we could have had the SNES but at least we get something. Enjoying it so far, tough as nails. Uhhh... Mega Man 8 was not a Playstation exclusive. It was released simultaneously on the Playstation and Saturn. @MitchVogel it's actually sprite size and screen resolution that are related. Games like this and Super Mario World are cropped because more pixels are displayed on the SNES versions(256x224) than can be displayed on the GBA screen(240x160). To shrink the games so they play the same would require removing pixels and detail and would be a lot more work than using the same assets. In the case of this game, you are right that the large sprites(relative to the screen resolution) are a flaw, but that's because the GBA can't display as much on screen. @accc Haha, thanks for pointing that out, I completely forgot the Saturn existed! I'll update the review to reflect that. That King boss was stupidly hard with Bass. The review should compare it to the original SFC version. The GBA version having good graphics is only because of that, not because they put any care into this (average) port, and the music is just terrible compared to it. This is a gimped version of an otherwise ok Megaman game. @MitchVogel No way. Mega Man and Bass is easily more difficult than the Mega Man Zero games. Maybe you're just bad at Mega Man Zero, or maybe you didn't get far enough in Mega Man and Bass to make a fair assessment, but there's no way any of the Zero games are harder than this. (weird joke) it's all about the bass! @mjc0961 Haha, not a chance! S-ranking all the stages in Zero was brutality. SNES game proves that MM8 could have been a lot better looking. However I do not like the lack of action. This game feels too laid back to play. The GBA game is for GBA players as with "Sonic the Hedgehog GBA". So your not really missing out on much. Just your typical one-hit wonder showing off the power of the SNES. This was a pretty solid Mega Man game. I liked how the graphics were directly ripped from the 32-bit Mega Man 8 game. Collecting all those discs added to the replay factor. That all being said, it would be nice if they released the Super Famicom version. At least there was a little more screen space on that one.